Every year, the Mark Kilroy Foundation has a community fundraiser to raise money for our S.A.F.E. Summer Program (a Safe Coalition project) as well as for S.A.F.E. Program projects during the school year such as support groups and lifeskills groups. 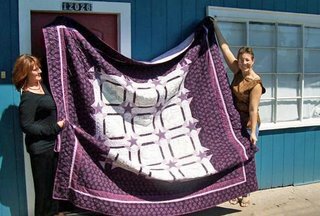 Last year, a gift certificate was donated to our silent auction for a handmade quilt by a big supporter, Lynn Watson. She sent us this photo of the finished quilt. It is beautiful. Also, Lynn has a reason to celebrate. Just last week was the anniversary of her bone marrow transplant and she is doing great! Her story is very inspiring. Thanks, Lynn. You are always in our thoughts and prayers.